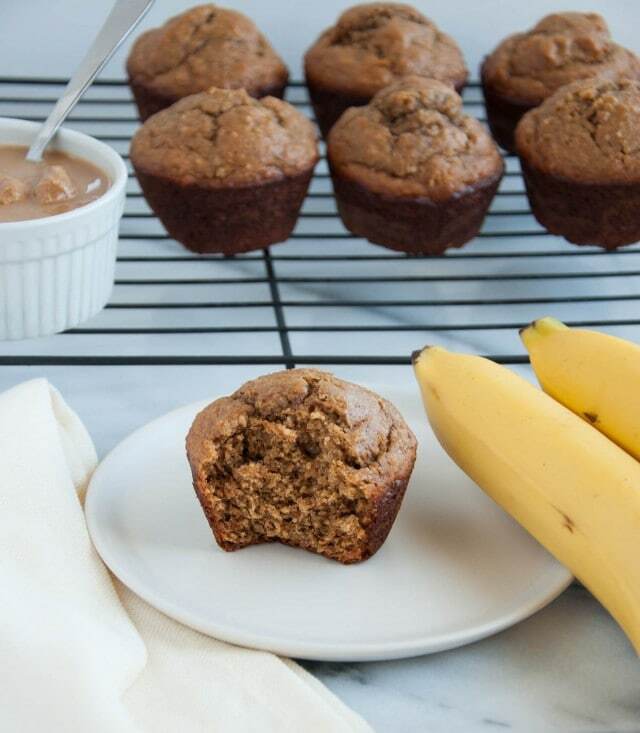 These peanut butter banana muffins are absolutely delicious, perfectly moist, and loaded with heart healthy oat flour and over 8 grams of protein. So. I know its been a hot minute since I’ve shared a recipe with all of you… In my defense, this summer has been crazy in my world. Absolutely insane I tell ya. But, regardless of how long its been, today I’ve got some wild news to share with these peanut butter banana muffins! I know wild is a relative term coming from a gal a few weeks shy of 30 that just ordered a puzzle off Amazon because it sounded like a good time. But a puzzle with glow in the dark koalas? How can one resist such a thing? I obviously can’t. All that frumpiness aside, I promise that this is newsworthy. A week ago I quit my job. Boom. There it is. I’m jobless… and absolutely thrilled about it. Catch me again in a few months when I’m destitute and regretting this reckless move, but today, well, today feels great. With the amount of travel and responsibility added to my position over the past year, I’m long overdue for a change. I’ve played the corporate game before and when the small energy efficiency consulting firm I work for got bought out a few months ago, I decided that I needed a break before jumping right into something new. Life is too short to stay at a job that isn’t fulfilling. So, now that the cat’s out of the bag, I’ll give you all the deets on these muffins. First of all, peanut butter and banana – hellooo deliciousness! This combo, also fondly referred to as the “Elvis,” since apparently the 50’s heartthrob ate PB and banana sammies when he wasn’t pelvis thrusting and singing his way into teen girl’s hearts across the globe. There’s a little nugget of food related history for ya. I think Elvis even threw bacon in the mix, which sounds totally weird… but almost good at the same time? I mean, its not on my top ten list of things to try but I wouldn’t shoot it down completely. Bacon or no bacon, these peanut butter banana muffins are pretty darn delightful. They are flour free and use ground up oats or oat flour as a base instead. This means that all you have to do to go gluten free is sub in gluten free oats. Simple and super healthy. Just the way I like it. For those of you who have been following my kitchen escapades for a while, you might be doing a double take since these peanut butter banana muffins seem eerily similar to the banana gluten free muffin recipe I shared a while back. Well, take my word for it that they are in fact quite different, and I think even a *wee bit* better. Not to diss my own recipe, but I’ve made these four times in the last two weeks. FOUR. And, I’ve been busy and not in a muffin making mood in the slightest. That is how much I’ve been loving them. One time, I used two smallish bananas and didn’t measure to make sure I had a full cup of mashed banana. That time they turned out a bit dry so make sure you have enough banana going into this recipe, or scale the rest of the recipe down if you don’t have quite enough. Also, you want those bananas covered in brown speckles. The ones pictured are merely for decor and are not banana muffin ready. The brown spots make them sweeter meaning you don’t need as much added sugar. Its a sneaky healthy muffin trick that I use time and time again. The muffins in these pictures don’t have chocolate chips in them, but if you have some on hand, toss ’em in. You’ll love it. I went ahead and factored them into the nutrition facts assuming we’d be on the same page about that. What’s a few chocolate chips between friends? Mix mashed banana, peanut butter, honey, vanilla, and eggs using a hand mixer. Make sure that you use a full cup of mashed banana and measure that first. Add dry ingredients and blend with hand mixer while scraping the sides of the mixing bowl until just mixed together. Do not overmix! Stir in chocolate chips (optional). Spray muffin tin with cooking spray or line with muffin wrappers. Spoon batter into prepared muffin tin, filling each cup almost to the top. Bake for 15 to 17 minutes until muffins are cooked through. Don't over bake or they'll be dry! I’ve made these muffins a number of times for family & co-workers to rave reviews & requests for the recipe. It’s a keeper. Things I love about it: It’s quick to make, works out consistently every time. (I get 1.5 dozen medium-sized delicious muffins from it. ), & freezes well (although very few muffins ever make it to the freezer!).. It has all the attributes I look for in a muffin — shape (a perfect dome), texture (soft, light, moist), tastiness (what’s not to love about that peanut butter, banana, chocolate chip combo? ), & healthiness (if you ignore the fact that I double the amount of chocolate chips (semi- or bitter-sweet) & that you can’t eat just one!). Thanks for sharing this recipe. It’s been a hit. I had to try these because I had no flour left and its Muffin Thursday.. so I my google find is this recipie. I had started and I found I had no eggs so I had to use the flax seed substitution. Also I didnt have honey so I substituted date syrup which I had just enough left. My kids really loved them as an after school snack. So i will make them again.